He stood in checkout line 3 at Albertsons, hugging a 30-rack of Coors against his body, clutching a fifth of tequila in his free hand. Over and over in his head, he recited his address and date of birth, staring at the ground until he was forced to make eye contact with the cashier. He looked up and smiled, not moving again until the cashier asked to see his ID. Kyle, a junior business major, extended his sweaty palm which held his Indiana driver’s license and 30 seconds later he was outside the store silently celebrating his first successful alcohol purchase. More than 40 percent of underage college students who admit to using alcohol possess fake IDs, according to a 2016 study by the Research Society on Alcoholism. And with the technology to produce counterfeit licenses outpacing the technology to detect their validity, it is becoming increasingly easy for students to get away with this illicit practice. In recent years, many retailers have implemented ID scanners for use during every alcohol transaction. These machines read either the barcode or magnetic stripe on the back of an ID and verify if the information matches with the DMV database. 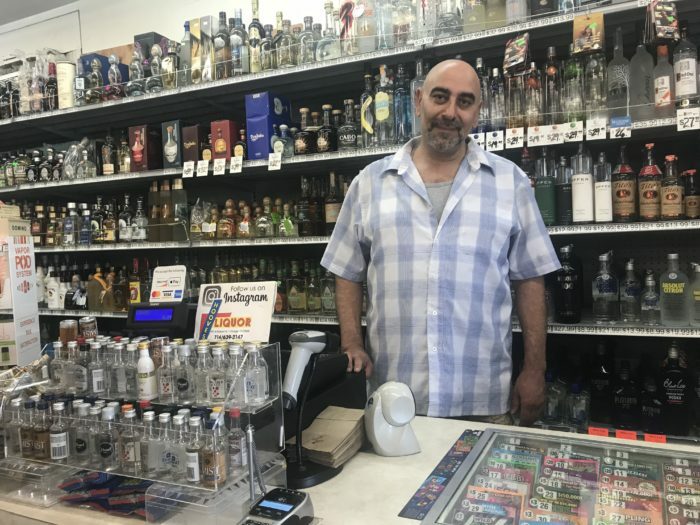 Due to a prominent history of students using fake IDs at Hooves Liquor, manager Rober Rashid has cracked down on store policies regarding alcohol sales. Though ID scanners once seemed like a foolproof system, barcodes have become fairly easy to fabricate. Additionally, companies are now able to recreate the even more complex components of state-issued ID cards. Standard California licenses include images and information that is laser perforated, tactile and only visible under ultraviolet light. An ID technician with KingOfFakes claims they are able to replicate all of these security features to a tee. The California Real ID features a new design and upgraded security features. An old or federally non-compliant ID will no longer serve as valid identification to board a domestic flight starting Oct. 1, 2020. Photo from dmv.ca.gov. 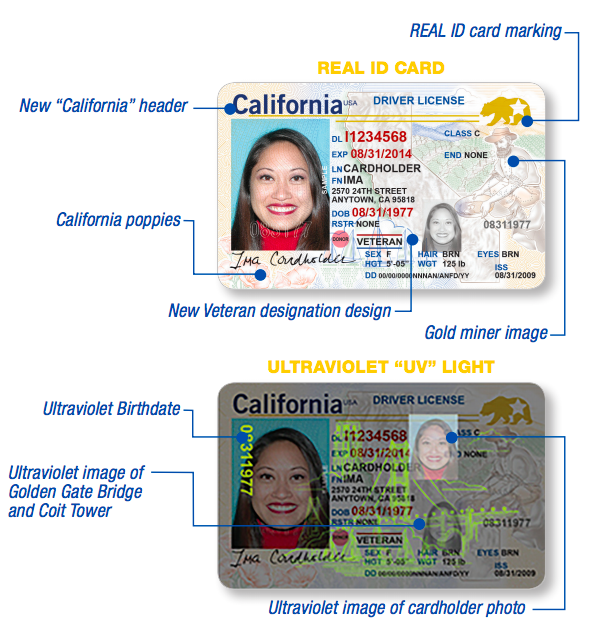 California IDs have had the same design since 2010 giving companies like KingOfFakes time to master recreating them, however that could soon change. * This year the Department of Motor Vehicles began offering new licenses, in compliance with the Real ID Act, a federal mandate that set standards for state identification. California’s Real ID features a new design and upgraded security elements. “The new card features include a gold miner image on the right side of the card and California poppies on the bottom left. Under ultraviolet light you can see an image of the cardholder’s photo, birth date, Golden Gate Bridge and Coit Tower,” said the DMV in a January press release. Even before the Real ID Act, students typically stayed away from using California state identification, opting for fakes from states with simpler designs like Ohio, Mississippi and Illinois. While authorities typically view this as an immediate red flag, minors tend to get away with it in college towns, due to a higher probability they are actually from out of state. The 2016 study found that only 12.5 percent of students reported having fake IDs before entering college, but that number increased every semester, peaking at 39 percent during spring of junior year. Another study, published in Addictive Behaviors in 2010, breaks down the methods which students use to obtain fake IDs. Most commonly, students use the real IDs of people over 21, with 45 percent using a friend’s and 24 percent using a relative’s. Carly, a senior health sciences major, has observed this same trend at Chapman. She believes borrowing or buying another person’s legitimate ID is more popular because these documents are more likely to permit entry into bars — even if measurables like height, weight and the ID photo do not match. While the success rates of this practice are purportedly greater, so are the legal consequences. In California, using another person’s ID is classified as identity theft and can be charged as either a misdemeanor or felony crime, depending on the case. Misdemeanors may be penalized by a fine of up to $1,000 and/or a year in county jail, while felons face up to three years in state prison and $10,000 in fines. To avoid this heightened risk, other students order custom fakes with their own photo and personal information, only altering their birth year to depict them as 21 or older. About 36 percent of students buy their own through an in-person or online retailer. Although this practice does not constitute identity theft, students still face criminal charges if caught. Minors in possession of a fake ID may be charged with a misdemeanor, fined $250 and required to complete community service. Additional charges can be tacked on for intent to buy drugs or alcohol, and in some cases the offender’s license is suspended for a year. Of course these penalties only apply when law enforcement is involved. After determining an ID is fake, many alcohol vendors decide to handle the situation independently. However, Orange Police Department Sgt. Phillip McMullin prefers they do the opposite. In order to stay in the know, OPD runs regular undercover operations, or “stings,” to restrain the use of fake IDs. McMullin explains there are three main approaches the department takes to ensure both customers and vendors are complying with alcohol laws. Since the beginning of the year, OPD has made 98 arrests for fake ID violations. 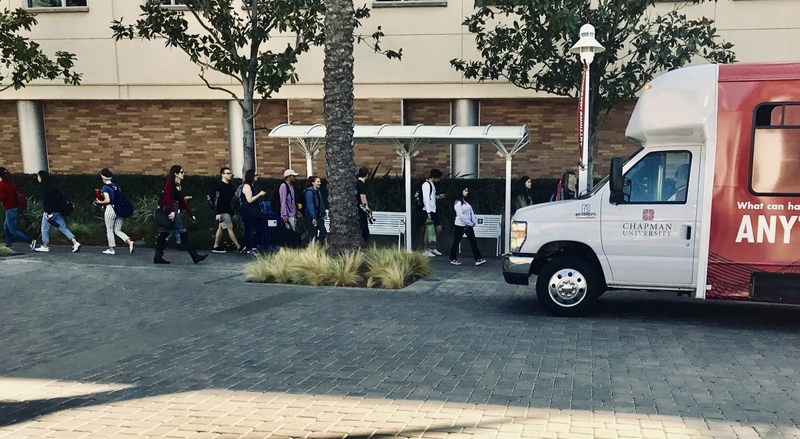 Their statistics do not differentiate between Chapman students and other citizens, but McMullin says the department gets frequent calls to the university area. At colleges around the country, Greek Life has become notorious for promoting binge-drinking, and the 2016 study revealed fraternity and sorority membership is significantly correlated to fake ID ownership. 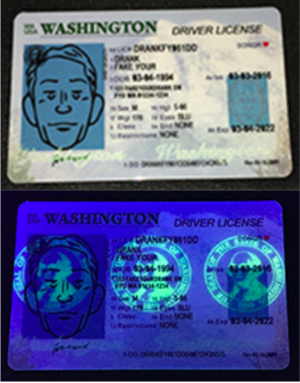 Sample of a fake Washington ID made by FakeYourDrank, with included UV security features. Prices range depending on the site, but typically the more IDs purchased, the cheaper each one is. Popular websites used among Chapman students are IDGod, FakeYourDrank and IDInState. Jonathan, a junior computer science major, also took advantage of the discount to order IDs for himself and his friends, seizing an opportunity to profit through his services. After placing his first order with ease, Jonathan decided to start a business, using his friends to help spread his name and develop his clientele. Jonathan has placed around 12 group orders in the past two years, making more than $1,200. Rachel, a sophomore graphic design major and one of Jonathan’s previous clients, says ordering IDs through him is worth the extra cost. While students are able to transfer money within seconds on Venmo, buying IDs isn’t quite as simple. Most online websites now require payment via cryptocurrency, such as Bitcoin. Using this method protects both the buyer and seller by keeping purchases anonymous. Further measures to disguise the illicit act are made during the shipment process. IDs made by companies in China are subject to inspection by U.S. Customs and Border Protection. To prevent triggering the interest of authorities, the IDs are usually hidden within other objects such as the soles of shoes, the lining of jewelry boxes or the back of picture frames. Even with multifaceted attempts for deceit, Customs is catching on. Between May and August, Philadelphia CBP officers seized more than 500 fake IDs, according to a press release by the Department of Homeland Security. The officers turned the IDs over to law enforcement for further investigation, but not every case escalates to this degree. When Nick, a sophomore biology major, had his shipment uncovered by Customs, his IDs were destroyed, but still delivered. Nick is not sure exactly what happened but took it as a warning from the government. His friends were upset they’d never get the IDs they paid for, but Nick refused to take the risk of reordering them. State and local law enforcement are making heightened efforts to combat the use of fake IDs, but McMullin knows they won’t put an end to the problem anytime soon. His advice to students is to be smarter during nights out in order to keep themselves and the community safe. *The DMV did not respond to multiple requests for comment. Chapman Expansion: How Big is Too Big? Previous post: Chapman Expansion: How Big is Too Big?